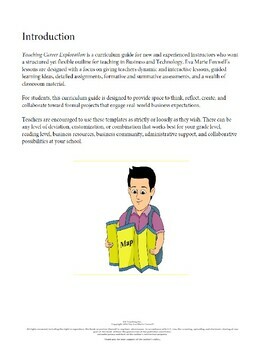 Teaching Career Exploration is a curriculum guide for new and experienced instructors who want a structured yet flexible outline for teaching in Business and Technology. Eva Marie Foxwell’s lessons are designed with a focus on giving teachers dynamic and interactive lessons, guided learning ideas, detailed assignments, formative and summative assessments, and a wealth of classroom material. This first unit of Teaching Career Exploration offers seven lessons to help students expand their self-knowledge in order to explore careers that fit their learning style, interests, strengths, and abilities. It is imperative that students begin exploring careers by increasing their self-awareness. It’s important to keep students focused on exploring careers during this unit. There is no imperative for them to find their one right or perfect career at this time. They should be asked to question their previous assumptions about themselves, their imagined careers, and their yet undiscovered abilities and talents. They should also be encouraged to conduct research and talk to experts to gain insight into real careers. 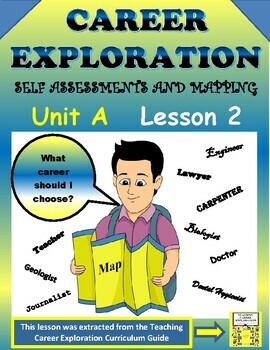 The ultimate purpose of this unit is to expose students to career resources and encourage them to explore careers through their unique set of likes, strengths, abilities, styles, and desires.